At the 2017 Hanover trade show, sensor experts EGE introduced new devices from their range of precise programmable pressure sensors with I/O-Link functionality. The LDS 1000 series expands the portfolio with sensors for large pipe diameters up to 200 mm. Sensors of the LDS 1000 series monitor consumption in compressed air supply systems via the robust differential pressure principle. They support a broad variety of options for energy-efficient monitoring and control of compressed air networks. 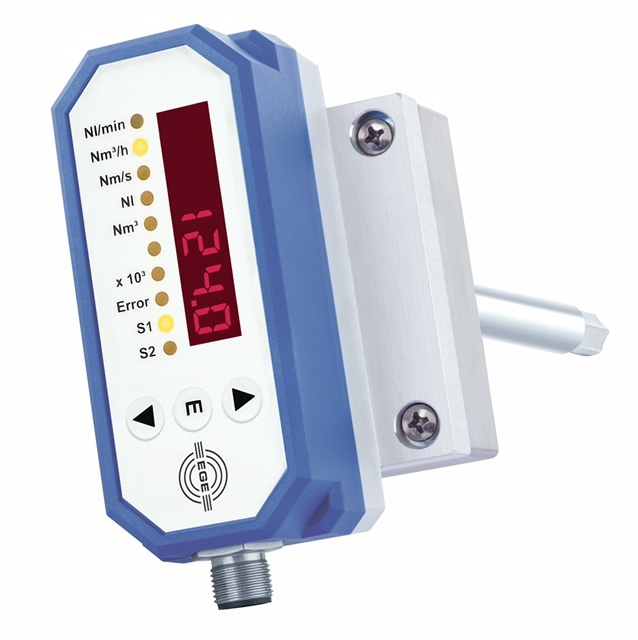 All devices in the series clearly show the air consumption of a pressure-supplied area, machine segment or tool on a six-digit display with sensor keys at the front. Alternatively, an I/O-Link connection facilitates easy readout of measured values directly by a PLC, as well as convenient parameterisation of the sensor from a PC or notebook. The robust immersion probes are resistant to dirt and provide additional measured values for pressure and temperature as well as leakage detection. Useful features such as a dosing function, hysteresis function, tampering detection, and a switch-off delay are also integrated. LDS 1000 sensors for measuring compressed air consumption are connected by means of a self-cutting screw for through bores. This allows them to be placed at an ideal immersion depth.